Source: News of Our Men in the Services, Battle Creek Enquirer, Battle Creek, Calhoun, Michigan, United States, 28 April 1944. 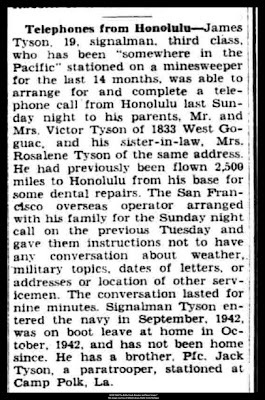 Telephones from Honolulu James Tyson, 19, signalman, third class, who has been "somewhere in the Pacific" stationed on a minesweeper for the last 14 months, was able to arrange for and complete a telephone call from Honolulu last Sunday night to his parents, Mr. and Mrs. Victor Tyson of 1833 West Goguac, and his sister-in-law, Mrs. Roselene Tyson of the same address. He had previously been flown 2500 miles to Honolulu from his base for some dental repairs. The San Francisco overseas operator arranged with his family for the Sunday night call on the previous Tuesday and gave them instructions not to have any conversation about weather, military topics, dates of letters, or addresses or location of other serviceman. The conversation lasted for nine minutes. 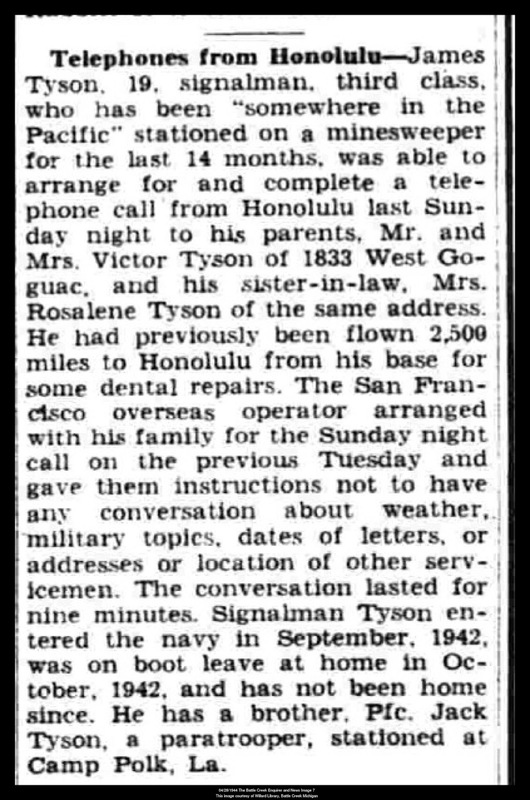 Signalman Tyson entered the Navy in September, 1942, was on boot leave at home in October, 1942, and has not been home since. He has a brother, Pfc. Jack Tyson, a paratrooper, stationed at Camp Polk, La. James Tyson was the son of Victor Tyson and Adeline Glover Tyson. James Tyson is my first cousin, once removed. The Battle Creek Enquirer had a series, "News of Our Men in the Services". 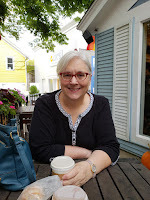 A file card of articles is available at Helen Warner Branch of Willard Library, Battle Creek, Michigan-my local library. Where in the World is Samuel B. Poor?